More proof that everything is cooler in Japan. Toysrevil.net has posted photos of the upcoming ULTIMATE MATRIX COLLECTION. As you can see, it comes packaged in a 2 foot long model replica of The Nebuchadnezzar ship. 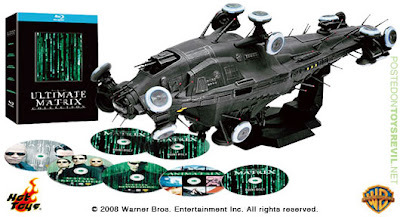 Crafted by Hot Toys (the awesome designers behind The Dark Knight/Bank Robber Joker figures), the ship is actually a disk holder for the 7-disk collection. This set is a Japan-only release, and is priced at over $375 but I just wanted to share its awesomeness with you. Visit Toysrevil.net for more pics.